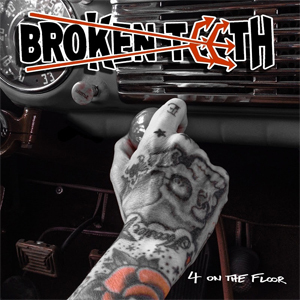 BROKEN TEETH, the Austin, Texas band led by iconic vocalist Jason McMaster (DANGEROUS TOYS, WATCHTOWER) have released the video for the title track from their upcoming new cd and vinyl album 4 On The Floor. Watch the video for "4 On The Floor" on KNAC.COM right HERE. Twenty years after seizing power in Austin, Texas, rock-roll battering squad BROKEN TEETH is poised to throw its hardest punch ever after signing with MEGADETH bassist David Ellefson and former Corporate Punishment President Thom Hazaert at their powerhouse EMP Label Group. The label will issue BROKEN TEETH's new album 4 On The Floor on April 21, 2017. Once described as “a pissed-off AC/DC”, BROKEN TEETH has evolved into a hard-rock/heavy metal bomb blast built on the swaggering boogie of bad-boy blues. Not surprisingly, 4 On The Floor continues the band’s gritty legacy with odes to the rebellious, forbidden love of rock-n-roll (the slow-stomping “Sinful”); standing proud as a loner (the riotous burner, “House Of Damnation”); life on the rock-n-roll highway to hell (the bluesy shuffle of “Borrowed Time”); and the ultimate salute to legendary MOTORHEAD main man, Lemmy Kilmister (the appropriately rollicking “Never Dead”, which was written before Lemmy’s passing). “We don’t really do tributes, but Lemmy and the kind of rock-n-roll he did is what we’re all about,” said BROKEN TEETH guitarist Jared Tuten. “It just felt right for BROKEN TEETH to immortalize him." Pre-order BROKEN TEETH 4 On The Floor HERE. For the latest band news and show dates, visit the official BROKEN TEETH website at BrokenTeeth.com.